1. Press the START button without touching the brake pedal. 2. Press the odometer button until you see "TRIP A". 3. Next, turn the ignition "off". 4. Press and hold Trip Odometer Reset button. Press the "Start" twice without touching the brake pedal. 5. Continue to hold down the Trip Reset button until "000000" appears on the display and the maintenance light turns off. There are various methods suggested in manuals and on the internet to reset stubborn Netgear Routers. Sometimes these methods do not work. I will go through the three methods I know of and start with the most effective to least effective, which should likely be executed in reverse order. Hold the reset button in for 1 minute while the unit is plugged in. This is what I believe to be the most effective method and has helped me reset a stubborn R7000. Hold the reset button for 30 seconds and then unplug (while depressing the reset button) for thirty seconds then plug in router and continue to hold the reset button for an additional 30 seconds. I have heard this method may not work with the newer Netgear routers such as the R7000P, R8000 etc. Hold the reset button for 8 seconds. This is the first option to take and should reset most routers. The room is packed, an offsite in Rome and an overflow room is present. The auctioneer speaks nearly perfect French and Italian. "The most iconic rolex wrist watch in the world, perhaps the most iconic wrist watch in the world"
What will this watch sell for next time? Are Rolex Spring Bars Different? How Much do Gold Rolex Springbars Cost? How do you buy Rolex Springbars? Are Rolex Springbars Different than Aftermarket? YES! Using the same procedure above, go to the AD, buy the correct springbar for your watch. Rolex springbars are different and they can change the fit, for example some presidential bracelets may slightly pop off with aftermarket. Gold Rolex watches come with solid gold springbars which help not eat into the watch case or clasp. How Much do Gold Rolex Springbars cost? Small Gold springbars are approximately $60 each and long ones are approximately $100-120. This is a very important! 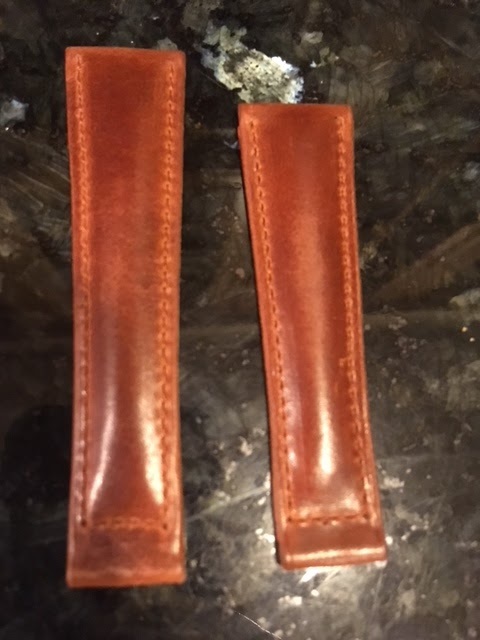 ROLEX LEATHER STRAP SPRING BARS CAN ONLY FIT ONE SIDE OF THE CLASP! One of the springbars will be shouldered, that goes on the non-adjustable end of the clasp. The other will have no shoulders, that goes on the adjustable side of the clasp. While both may fit initially removing the springbars in the future will be much more difficult if installed incorrectly. Do not just push on one side of the springbar with a small tool. Try to push on the whole springbar with a flat surface then pull from the other side from the "fat" surface of the springbar. The idea being that you do not want to put too much stress on the sprung portion of the springbar so for example push on the "stationary" parts of the springbar, or the whole springbar together. 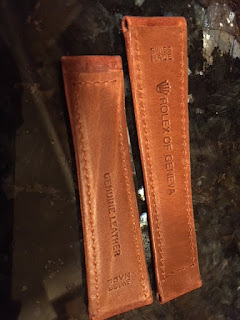 I often hear questions about Rolex Leather Straps, not the aftermarket straps but straight from Rolex Leather straps. Since so many models of Rolex are standard with bracelets or now Oysterflex, there is limited information about Rolex Leather Straps. For example there is no place on the official Rolex website where you can see all of the different Rolex Leather Straps. Where can I find Rolex Leather Straps? Rolex AD is the best way to buy and find Rolex leather straps. The cost of Rolex leather straps actually fairly reasonable about $180 for Calf and $360 for hand stitched crocodile (for a 16518). How do I buy Rolex Leather Straps? Rolex AD is an easy answer but there is a caveat. In the same way Rolex will not sell a green bezel for a normal 16610 they will not provide leather straps for watches that are not provided with factory leather. So you'll need to have a somewhat good relationship with an AD and the model number for your watch, or perhaps you can bring your Rolex in to the AD. Can I buy a different Rolex Leather Strap than was provided with the watch originally? Yes! There are often various options for each Rolex provided with leather straps. Is there a catalog of the available leather straps? There is a way to find the various leather straps available. Go into your Rolex AD. The Rolex AD has access to a network/website where they can enter your watch model number and see the various parts they can purchase for it. In this Rolex AD parts website click on the strap and you will see the various options of leather straps available for your model. The Rolex Daytona on leather, which is a great reference has various options available including: small scale crocodile and large black, brown crocodile with and without contrast stitching, various colors of calf leather as well. Read more about Rolex Springbars here! I've heard much debate about the size differences between various Rolex Daytonas. I have also seen all sorts of obscure measurements that seem to show the Rolex Daytona is smaller than the 39mm or so. Many of these measurements do not go across the dial through the circumference, some just measure the bezel. The Rolex Daytona is very similar in size to a 5 digit Rolex professional model, but some ARE bigger than others. 1) Rolex Daytona Stainless Steel from Zenith Daytona to the Ceramic 116500 Daytona all stainless Rolex Daytonas are the smallest of the bunch. 1a) Rolex Daytona Full Yellow Gold, full gold bezel, full gold bracelet Daytonas are purported to be the same size as Steel Daytonas. 2) Rolex Daytona Yellow Gold Strap from Zenith (16518) on (116518) are slightly larger than Stainless Daytonas as the bezel does not fully eclipse the case at the "400" tachymeter mark when viewed straight on. The lugs are slightly longer and more symmetrical but not fully symmetrical or "thick" But they are not as big as Platinum Daytona "Platona" or RG/WG. I believe the 116518 is slightly larger than the 16518. 3) WG/RG On strap or full gold bracelet are bigger than on Yellow Gold strap and full yellow gold Daytona. 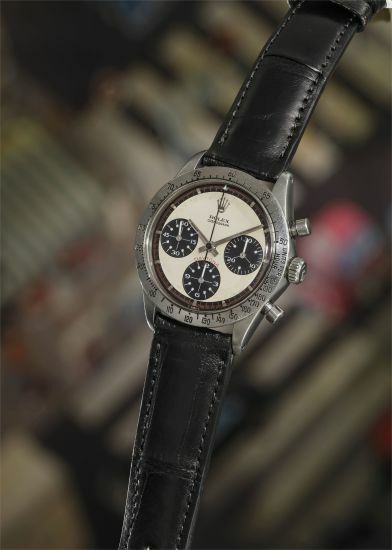 I am not sure if this applies to the White Gold strap Daytona Zenith, I will research it more, as that may be the same size as #2. The lugs on these are symmetrical and thick. I figured I should write a review on the 2017 Toyota Avalon because it includes Lane Keep Assist and autonomous Forward Braking standard and also because I like cars. So I figure I will add some car reviews here but may start a Cliff's Car Review, to add reviews about other cars other than the Range Rover which are under OffRoadRover.com. Alright down to brass tacks. Like almost all big sedans the depreciation on the Avalon is horrific. Truly nightmarish. But that also makes it a smart pre-owned buy. At about 20k the Avalon is an incredible value with some flaws that can be fixed. Here is a bullet point overview of the Avalon. The Avalon comes loaded. Even in standard XLE trim it comes with leather, real leather not Toyota faux leather that comes on the 42k TRD Pro 4Runner or the Lexus ES350. The only other toyota that comes with standard, real, leather on this side of the world to my knowledge is the $84k Range Rover class Land Cruiser. The other packages add to it, but for me I need leather in my car, if it doesn't have leather I'm not buying it. After all the hides of the steaks we eat should be used. The Avalon comes standard with a 7" screen and a color 3.5" dashboard screen. The radio comes standard with XM. I updated the speakers to infinity speakers, and with my experience with my last toyota with JBL sound, I found the standard stereo easier to upgrade partially because each of the 8 speakers gets full signal so you can just add nice speakers with crossovers. There is also an aftermarket android headunit available. The stock sources is not bad but is certainly compressed. The EQ is best on Bass +3, midbass+2, treble +0 but you may run into rattles. I will do a whole article on the sound system in the future, I think it applies to many common era Toyotas. The drive is ok. There is actually a somewhat built in front tower strut (I added another one and then realized there was somewhat a strut brace built in). You can actually take corners in the car without feeling like the car is about to roll over as you would in a Generation 2/3 Prius. The hard bumps do transmit in plastic rattles but overall it is a fairly good ride with a combination of sporty grand tourer. The car rattles like it was made to rattle. The two biggest offenders are the dash end caps and the rear c pillars which if you remove them there is an area where a clip could be used but isn't if you add high strength velcro here it eliminates much of the rear rattle. The dash end rattles can be mitigated with a combination of velcro on the inside and some foam on the far side near the rubber trim. There is a TSB for Avalons with memory seats. The style is akin to an Audi since the Audi designer designed it. The paint is quite an upgrade from Toyotas from a decade ago. The wheels too are upgraded with very intricate paint finish.